I most warmly welcome this initiative of Women Icebreakers by the 48 Group Club. 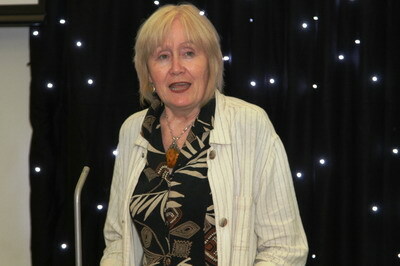 Also I would like to congratulate Ms Lillian Davies, and the Treasurer of the 48 Group Club, Ms Mei Sim Lai. I learned that it is through their efforts we have gathered today a very distinguished group of British women. I applaud this new initiative that will make a contribution to deepening and strengthening links between China and Britain. In a fast changing world, it becomes ever more challenging to keep pace with levels of understanding between the nations of the world. In turn that means there is an ever increasing need for boosting the work of the 48 Group Club. The spirit of the 48 Group Club's commitment to 'developing positive relations with China' has never been more important. It may be helpful to share with you my thoughts on this occasion in the context of a few numbers. 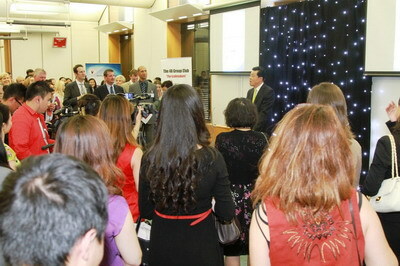 This is the first women's event I have attended as Chinese Ambassador to the UK. I believe this is also an ice-breaking in some ways. This may be just a coincidence, but it also indicates how relevant the ice-breaking spirit remains. We do need new people, who are dedicated to the China-UK friendship, to join the ranks of ice-breakers like you, regardless of age or gender. Next is the number two. By this, I meant two women's organisations. Let me say a few words on behalf of my wife Hu Pinghua. In my Embassy we have a very active group too. We nickname it an NGO, 'Non Governmental Organisation'. I am of course referring to the Chinese Embassy Women's Group. It is a fair large group and draws its membership from women diplomats and wives of the Embassy staff. The CEO of this NGO is no other than my wife Pinghua. As head of the Women's Group, she has asked me to convey a message to the Women 'Icebreakers'. The message is that her Women's Group is ready to establish a long-term, strategic and special partnership with the Women 'Icebreakers'. Pinghua also proposes that the two Women's Groups set up close contact and co-host events to promote understanding and exchanges between the people of our two countries. Next is the Number three. We all know that the 'Icebreakers' were founded more than half a century ago. 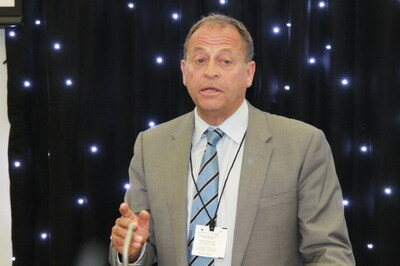 They broke the trade embargo imposed on China and so reopened trade between China and the UK. Three years ago, we saw the birth of the 'Young Icebreakers'. This initiative mobilises and encourages young people to contribute to China-UK relations. Today we are gathered here at the launch of Women Icerbreakers. So, I must congratulate the 48 Group Club on 'breaking the ice' for the third time. The three ice-breaking missions may have happened at different times in very different contexts with the support of different people, but they all serve the same purpose - promoting China-UK friendship and cooperation. Next is the number four. 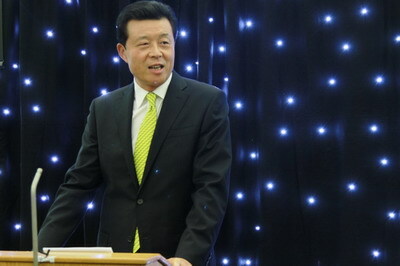 Premier Wen Jiaobao has just concluded his fourth visit to Britain since he took office. This visit has further increased mutual understanding and trust between our countries. It has advanced our exchanges and cooperation across the board. That advance is the benchmark of what happens every time Premier Wen visits - taking China-UK relations to a new level. The final number in my mind is five, or 50% or a fraction - half. I am sure that many of you will know that famous Chinese saying: 'Women hold up half of the sky.' Women are playing a bigger role in Britain. I noticed that the present parliament has 139 women MPs, the largest number ever in history. China's women have enjoyed greater opportunity than ever before. The evidence is that women excel at all professions as equals of men. I have every confidence that you, Women 'Icebreakers', will become another important force for China-UK relations. We at the Chinese Embassy will do what we can to support you, and together, let us work for a stable and sound relationship between our countries. Again I warmly congratulate the 48 Group Club on launching the Women Icebreakers. 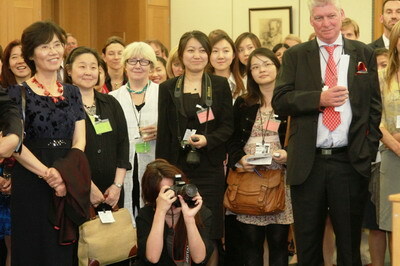 I wish all its women members every success in building a powerful new contribution to China - UK relations.